CHIPOJO LAB: Why Does Transmission Matter? Today was our last day of data collection. Overall our trip was a successful one; we achieved our goal of collecting habitat spectral and dewlap data of the six dominant members of the Jamaican anole community. Also, over the years I have stressed that the amount of light transmitted through the dewlap can contribute greatly to signal detection, by increasing overall brightness. 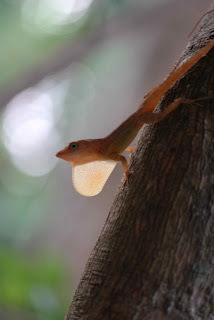 This is particularly relevant for species that inhabit relatively shaded forests, as is the case of Anolis lineatopus. Under shaded conditions the expectation is to find relatively bright dewlaps. One mechanism to achieve high brightness is to have high transmission, which would result in a sudden bright signal against the relatively dark background. This sudden increase in brightness is known as the "Gelb Effect," which is commonly studied in humans to evaluate the role of luminance in signal perception. Because a picture is better than a thousand words, the above photograph of a male A. lineatopus flashing its dewlap is a nice illustration of the Gelb Effect. Note: if I had taken this picture using a flash, the Gelb Effect would not be present.